Your Baby Can Balance with the Brilrider*! We have taken the Brilrider experience several notches higher with the Brilrider FLIGHT! 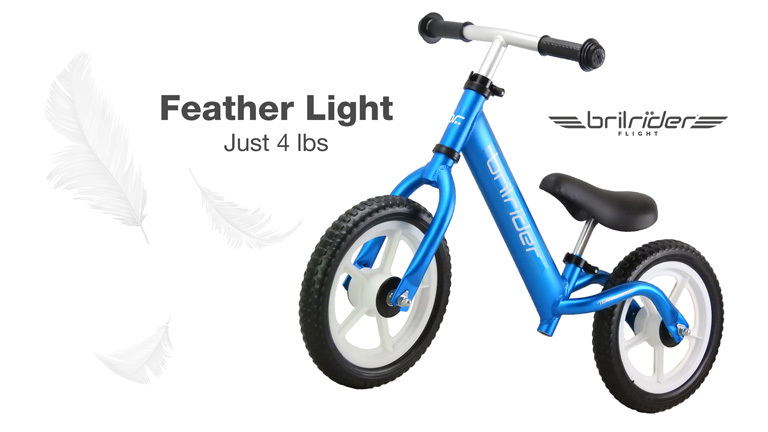 The Brilrider FLIGHT is the world’s lightest balance bike. 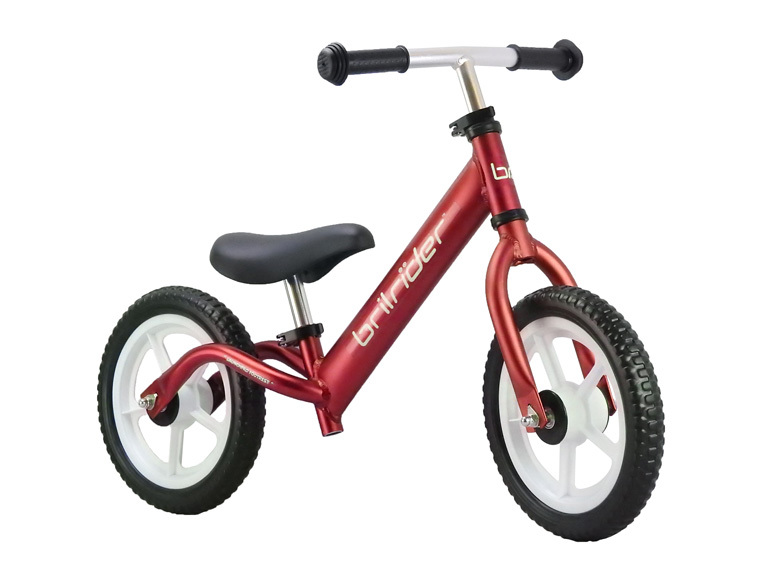 It is manufactured with your child at the heart of the manufacturing process. 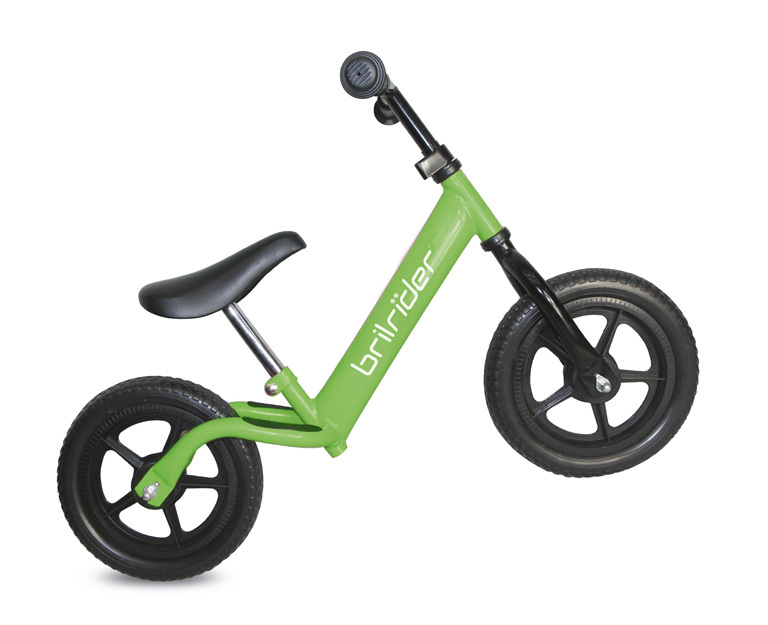 It is made with Airplane Grade Aluminium and this makes it tough, durable and insanely light, that even a 1.5-year-old can take control of it confidently and a 2-year-old can easily lift it. This bike is for discerning parents who want nothing but the best for their 1.5-5 year-old child. The Brilrider FLIGHT experience is unmatched and both your child and you will cherish the experience for a lifetime. Just imagine your toddler, 2 or 3 years old balancing a two-wheeler! Yes, the Brilrider does it effortlessly and the Brilrider FLIGHT takes it to a whole new level and Makes Living Fun! Pick any one of our stunning metallic shades now and watch your baby cruise along! Your Baby Can Balance, with the Brilrider*! Brilrider FLIGHT helps 18 months-5 year-old children learn to balance like no other two-wheeler in the world. Ultra-Light, Airplane Grade Aluminium makes it weigh an unbelievable ~4 Lbs! No trainer – wheels needed! Warning: Adult supervision at all times during use is highly recommended. This is a two wheeler and use of helmet is highly recommended to prevent injury. By purchasing this product, the parent/customer indemnifies Bril, Bril India Pvt Ltd and all Brilrider associates of any mental, physical, emotional or monetary liability to the child, parent or any third party that may arise due to use of this product. 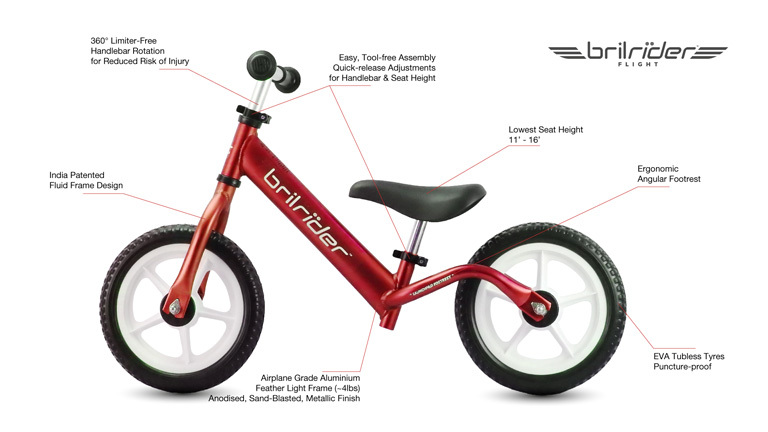 India’s favourite balance bike is coming to USA! It’s so light, your 2-year-old can lift it! The seat goes so low that the youngest of toddlers can walk with it. Designed to perfection for our children and now helping children world over learn to balance! Your Baby Can Balance with a Brilrider*! 12″ EVA tubeless tyres make Brilrider more than 48% lighter than other bicycles without trainer wheels and 66% lighter than steel bikes with trainer wheels! No more flat tyres too! 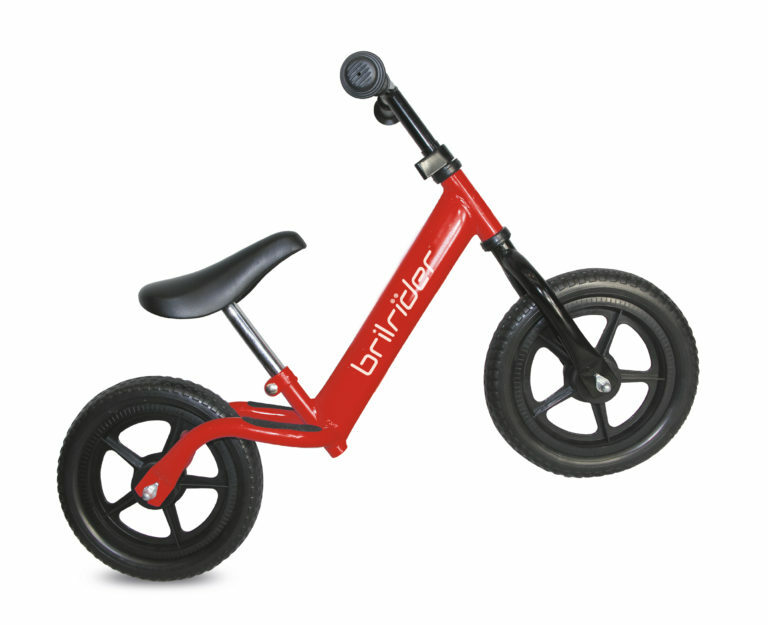 Ultra – light metal frame – it’s so light (less than 6 Lbs) that even a 2 year old can lift it!